It all started out with a conversation almost two years ago in a pub with friends. “It’s my 30th this year, I want to run the New York marathon, whose in?” Well, I’m not one to turn down a challenge (plus a few beers helped with the surety that we could do this) and so I agreed to run it with him. 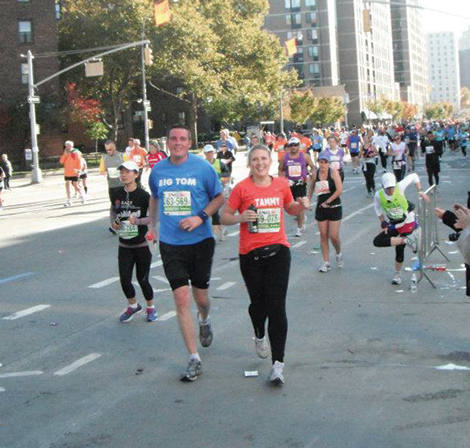 It turned out to be one of the best feelings in the world, running that marathon. You are tired and weary, painful doesn’t even begin to describe how you hurt at the end, but the feeling of accomplishment as you cross that finish line is something else and makes every mile trodden in training worth it. Two years on we’ve decided to do it again, but this time much closer to home – the London Marathon being the chosen challenge, the only difference being we would do it for charity, slogging miles in rain, wind, sunshine, you name it, in order to raise money for a cause close our hearts. It was a no brainer for me, my choice of charity is Battersea Cats and Dogs Home, and for a very special reason. 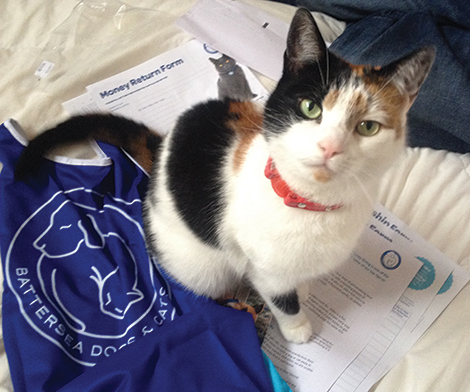 My love of Battersea properly kicked in October 2012, when a furry (albiet very scared but feisty) calico moggy crept into my heart via the pages of the Battersea website. 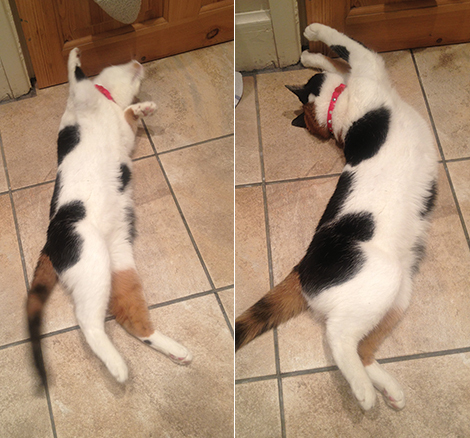 We hadn’t even planned on getting a cat – sure it had been floated around a few times as an “in the future” thing – but it wasn’t something we had really spent ages talking about. That is until we were sitting in bed one Sunday morning and decided to just “look” on the Battersea website to see the cats. Her cheeky face melted my heart and we kept on going back to her profile, each time acting as confirmation that she needed us and we needed her. Needless to say, a week later she was home with us, settling into her new life. 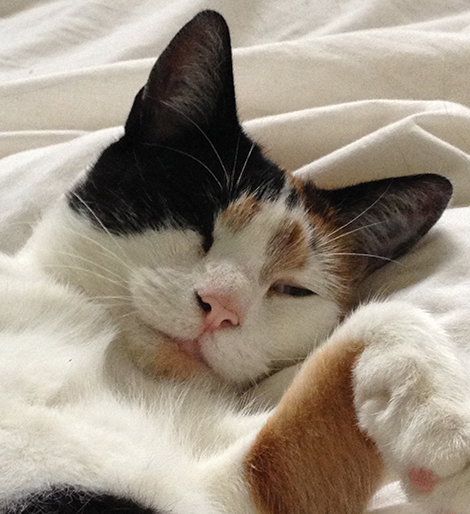 She had had a rough start in life, a stray brought into Battersea by a member of the public, but had almost certainly had a home of sorts at some point previously as she wasn’t feral. She was very head shy, liked a nip or three when she fancied it and didn’t think twice about using her claws. But all this was done in fear, the more she settled in and learnt that she wasn’t going to get hurt, realised that she wasn’t in danger, and the more she learnt to trust, the better she became. The nipping became a rarity, claws gave way to paws and cuddles became a very important part in her life. 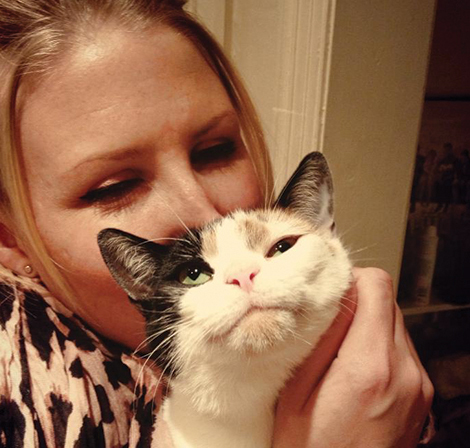 Over time, with lots of love, patience and trust, she has turned into the most amazing little cat, who answers (literally!) to the name of Flo. She is chatty and cuddly, yet still has her feisty side when she has a Flo moment. She has become such a part of our lives and hearts that I wonder what we ever did without her. This may sound a little OTT, but when you see such a change in an animal over the space of merely a year, it makes you appreciate what the guys at Battersea do for animals like Flo. That’s not to say I didn’t support and believe in the amazing work that Battersea do before we got Flo, but having experienced it firsthand it made me appreciate just how much work they do, love they share and care they give to these lost and abandoned dogs and cats. They help create better lives and forever homes for many many animals that may never have been given a second chance in life. So that is why I have chosen to don my running shoes again and pound the streets of London at ungodly training hours for Battersea Dogs & Cats Home. They need and deserve every bit of help they can get to continue the incredible work they do. Every little bit helps them get lost or abandoned cats and dogs off the streets and into safe, loving environments where they can get mend and find their forever homes. I’m only just starting out on this journey of running and fundraising, so it you want to join me in my quest and donate to a very worthy cause that would be greatly appreciated! Every little bit helps and every penny goes to a cause that I truly believe deserves it. The age old saying “you reap what you sow” stands so true here, which is why I believe they deserve my support – it’s my chance to pay them back for bringing me my bundle of furry joy that greets me every night when I get home from work. And every time I feel like I can’t go on I know have the support of family and friends who are with me on my journey to motivate me to keep on running. Here’s to the next 5 months of training – I know it’ll all be worth it!